Thabo Kunutu is a music producer, songwriter and sound engineer fresh on the SA music scene. 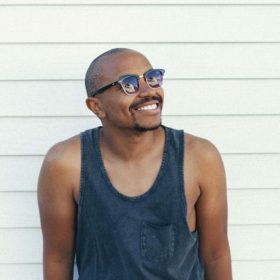 After graduating from Wits University with a BADA, Thabo worked as an engineer with Pieter Toerien Productions where, in his off time in hotel rooms around the world, he honed his skills as music producer and mixing engineer. He’s been working in the industry for 10 years and can be found mixing and fixing all things musical alongside some of the country’s top producers and musicians. Thabo is also the musical director and electronic drummer for the Bianca Wood Band. He’s co-written several songs that have debuted on radio stations across South Africa. If he isn’t behind his DAW, you might find this old Saint Stithians boy on the tennis court, watching a film or travelling abroad.